In this zone of silence, satellite antennas are tested ahead of launch. Metal walls form a ‘Faraday cage’ to block all external signals, isolating the facility from TV and radio broadcasts, aircraft and ship radars, and even mobile calls. Spiky foam cladding absorbs radio signals internally to create conditions simulating the infinite void of space. 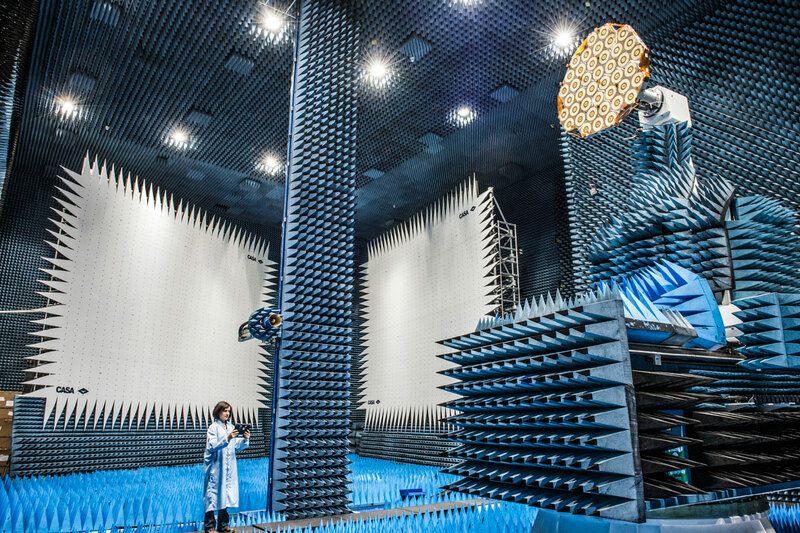 The white surfaces in front of the ‘anechoic’ blue background are reflectors that pass signals from an illuminating antenna to the antenna under test… To increase its capabilities, the Compact Payload Test Range (CPTR) was recently equipped with a state-of-the-art Near-Field Scanner (NFS) to measure the electromagnetic fields closely surrounding a test antenna. Via mathematics, the equivalent radiation at large distances is calculated.